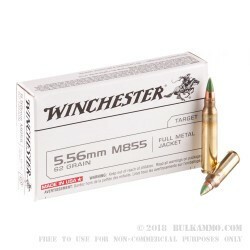 Winchester Ammunition is one of the most trusted American ammo brands. 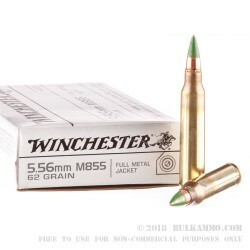 This 5.56 NATO ammo comes in a 1000 round case, and is top-of-the-line AR-15 ammo for firearms chambered for 5.56 NATO pressure.Each cartridge is brass-cased with a Boxer primer and weighs the standard 62 grain-weight. The SS109 cartridge was chosen by NATO as the second standardized rifle cartridge after the 7.62x51mm. The SS109 was named M855 by the US military and is also called 5.56x45mm NATO. 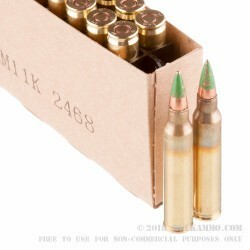 Recognized by its green-tip, the M855 is known as Penetrator ammo as the bullet was designed to meet the U.S Continental Army Command's parameters for small-calibre, high velocity rifle ammunition which included penetration of a .135 inch steel plate at 500 yards. It is not, however, considered armour piercing. The armour piercing variant of 5.56 mm is the M995 which has a tungsten core and is painted with a black tip. Reliability. I purchased this ammunition for range use in CQB style training scenarios using an IWI Tavor rifle with the 18” barrel and a 3.5 MOA Red Dot tactical optic. This ammunition was 100% reliable with zero FTF/FTE. However, I have conducted extensive testing with a total of 11 different brands and/or weights of 5.56 for this particular rifle and I have never had a FTF or FTE with any of them. I believe this is a testament to the incredible reliability of the Tavor platform vs the quality of any particular brand of ammunition. Most of the ammunition with which I train is higher quality (read expensive), but even the cheapest ammunition tested has been 100% reliable. Consequently, over recent years, I ‘ve come to expect 100% reliability and actually see that particular trait as a standard performance characteristic of modern ammunition when used in a quality firearm vs some lofty goal that is only attained by purchasing expensive ammunition. Cleanliness. I find this particular ammunition to be a middle of the pack performer in the cleanliness department. You will likely not be impressed nor disappointed by this round’s fouling effects. Q: Are those green tipped bulletd armored piercing? A: Hello Chelly, Green tip ammunition is not considered to be armor piercing. 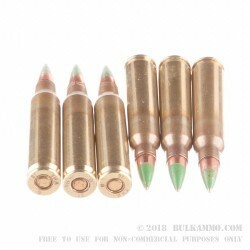 Green tip ammunition is listed as being a steel penetrator as it does have a steel core. This is not the same as Black tip ammunition which is true armor piercing.